The most common (and imho boring) unique thing imaginable – you’re a child of an icon! Congrats! Bet you’ve never seen that one before, right? Sorry, but when the icons themselves are basically archetypes, being kin to one is an archetype of its own. The fluff-only write-ups of the respective icon-parentages are pretty solid, with different pieces of advice each: A child of the archmage may be grow in a vat or a living seal of an elemental pact…or he may have this picturesque cottage where he’s just “dad” in the middle of nowhere – so yes, there is variety here regarding the suggestions and narrative options to be explored. Unfortunately, much like the cardboard cutout themes of the icons, so do their children fall into the default narrative structures: Kill the bad parent/dead-beat icon/travel the lands incognito to gain strength – you name the cliché and it’s here. Now mind you, I did not expect this pdf to bubble with imaginative potential, but I at least expected more variation – a bunch of the write-ups boil down to “mystic union,” some others to “begin filling foot-steps/gain approval of parent” etc. -whether positive or conflicted, the relationships overall felt pretty bland and stale to me, with perhaps one exception: The idea of the lich king providing a classic, lich-powered education for a living child is pretty hilarious and the one suggestion herein I liked. Btw. : Do not expect any mechanical ramifications for being an icon’s child – no exclusive talents, no racial abilities, nothing. Not even a bonus on relationship die rolls or interesting modification thereof. Editing and formatting are top-notch, I noticed no significant glitches. Layout adheres to 13th Age’s 2-column full-color standard with nice full-color artworks. The pdf comes fully bookmarked for your convenience. 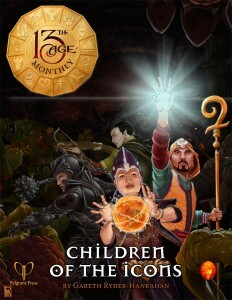 You can get this installment of 13th Age Monthly here on OBS.